Celbi scooped the prize as the Best Large Export Company – Tradables. The Export and Internationalisation Awards are a partnership formed by Novo Banco and Jornal de Negócios which recognises companies with the best export performance and awards prizes for those which have been successful in international expansion. The winners of the 7th edition of the awards were announced on 6th November, at a ceremony which brought together the managers and entrepreneurs with the highest export figures and who have a strong global presence. 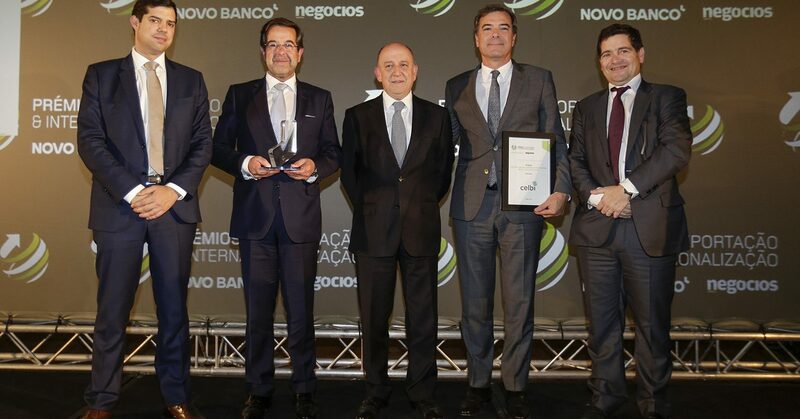 The award was presented by the editor of the Jornal de Negócios, André Veríssimo, the chairman of Novo Banco, António Ramalho, and the member of the judging panel, Alberto Castro, a professor at the Faculty of Economics of Porto. Receiving the award were Celbi’s directors, Nogueira Santos and Carlos Van Zeller. In the category, the winners are decided by analysing composite indicators based on economic and financial indicators collected and processed by Iberinform. Of the more than 341,000 companies who had submitted their annual Financial Statements via the IES (Simplified Company Data), 52,802 recorded exports in 2016, of which 3,280 were analysed in order for the awards to be made. Having analysed the data, the judging panel chose the winners. The Export and Internationalisation Awards judging panel comprised independent personalities who are separate from the event organisers: Alberto Castro, a professor at the Faculty of Economics and Management of the Catholic University of Porto; Filipe de Botton, the chairman of the Portuguese Diaspora Council, and Gonçalo Lobo Xavier, the vicechairman of the European Economic and Social Committee.